Plays through city park at elevation above 6000'. Heavy pines and brush. Discs and course map at the Aquatic Center. Cool designs notched/troweled into each tee. Course map at 2nd website. Corner of Hwy 60 and Hwy 260 at Show Low City Park. 1st tee is just behind the board in the middle of the park. Sunday 9 am league. 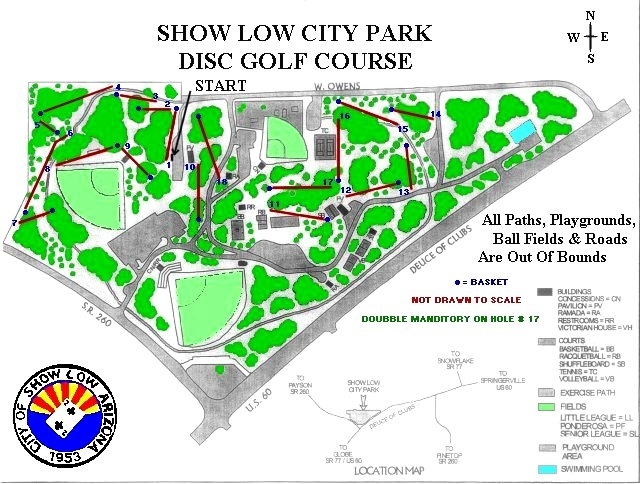 Have you played at Show Low Disc Golf Course? Be the first person to review this course!